The below essay is in response to the monthly wine writing challenge (#mwwc18). The subject matter for this month is ‘crisis’. I’ve read a lot recently about Bordeaux being in crisis, and how another year has crept by with a less than successful En Primeur campaign. With the top rated vintages of 2009 and 2010 now slipping further away, many drinkers around the world are slowly losing faith in the once exalted wines, and are seeking solace elsewhere. Whilst it is true that the Bordeaux En Primeur campaign only features what amounts to a handful of estates, the knock on effect is felt further afield and, along with the Chinese-Bordeaux love affair significantly cooling of late, ‘Brand Bordeaux’ has taken a knock that will affect any producer in the wider area. Customers are therefore having to be creative about where they spend their wine money, and the net result actually forms a positive, giving a spectrum of other producers an opportunity to increase their sales. With the limited Burgundy production pretty much already spoken for, people are reported to have been gravitating towards the Rhone as a quality French alternative. My point is thus: From within a crisis, lies opportunity. In contrast to the big money, sprawling chateau and significant foreign investment we see today, at one time wine production in France could have been a byword for disaster. In fact, disaster is too small a word for it, and crisis is far better suited. The diminishing En Primeur interest is small fry compared to the destruction seen during the years of conflict and occupation of the first and second world wars. Not only were the dreams and potential of an entire generation wiped out in the battlefield, but also those of a younger generation, as many children died in the vineyards collecting the grapes to keep businesses afloat. France was in serious trouble and, adding insult to injury, the scars of war followed another crisis that was only just being resolved. A crisis that, even 150 years after it first occurred, still influences pretty much every bottle of wine that we drink today. From pretty much anywhere in the world. I’m sure most readers of a wine website will be familiar with its cause, the effects, and the struggle to understand and combat it (If not, there are a handful of very good books that go in to immense detail about it). What these books rarely touch on is the opportunities that came out of the biggest crisis ever to hit winemaking. With hindsight, and with the ability to leave aside the human factor (the vineyards grubbed up, lost fortunes, and broken livelihoods and the debate of whether the end justified the means), Vintners were able to start afresh. With this came the ability to re-choose, or simplify the varieties that they were growing, perhaps even planting to fashions of the day. It gave them the opportunity to re-think their plots, and perhaps move away from the plains on to hillside slopes. It allowed the botanists to further their understanding in to the lifecycle of vineyard pests and what a vine needs to survive. It developed the concept of grafting vines, which is still practised today to be able to quickly change which varietals are being grown. 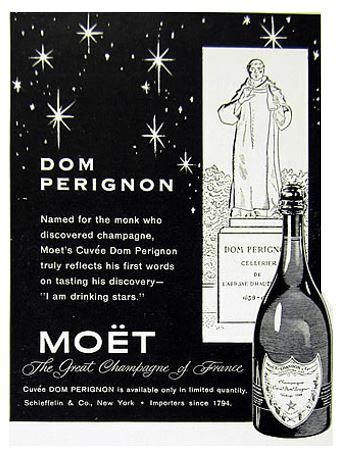 In a perverse way, it even fuelled the notion of a wine nirvana – the untouchable ‘pre-phylloxera’ wine, which creates interest at auction, or provides a unique selling point. Champagne such as Krug’s Clos du Mesnil, for example, comes from a tiny walled and un-grafted plot, and because of this very fact sell for hundreds of pounds per bottle. The even rarer Clos d’Ambonnay can sell for thousands per bottle. Following Phlloxera, and the destruction of thousands of hectares of French vineyards, cheap wines were imported from Spain and re-labelled as French, in order to satisfy the continuing customer demand. To stop this adulteration and to control production levels, the appellation contróllée system was developed and introduced. This fierce protection of place spearheaded by France has been now copied in virtually every part of the winemaking world, from American AVA’s to the German Pradikat system. If it wasn’t for Phylloxera, the appellation system may never have been developed, certainly not as early as it was, and perhaps even the notion of terroir would not be so prevalent. Of course the stringent (certainly in France) appellation system has its critics, and I look on with amusement as the infant English wine market already looks to impose strict boundaries on production (based on county divisions as opposed to anything terroir linked). What does make Sussex better than Kent? Perhaps Kent will then try harder than Sussex, and go on to produce better wine? From one big crisis 150 years ago, come so many opportunities. For some time now I’ve been intrigued by the ‘Kimmeridgian Chain’ – numerous vineyards set within a belt of distinct soil (AKA Terres Blanches), that diagonally cuts its’ way across northern France (see picture below). The belt itself is a by-product of a geological feature known as the Paris basin – plates of land staggering progressively inwards. As part of this sagging process, a defined strata of land became exposed between two layers; an older Jurassic era ridge of crushed marine deposits, comprising a hard limestone top on a chalky marl base (marl is composed of lime-rich clay and silt). The name Kimmeridgian is said to originate from the village of Kimmeridge in Dorset,England where there is a well exposed coastline of similar age and soil composition. The distinct soil mix brings differing attributes to resulting wines, even those produced in the same wine regions, but not within the belt. In some cases, different grape varieties are used to compliment the soil variation. This being the case, why were these unique vineyards simply swallowed up in to other wine regions? Regions that are many miles away, across land not used for viticulture. 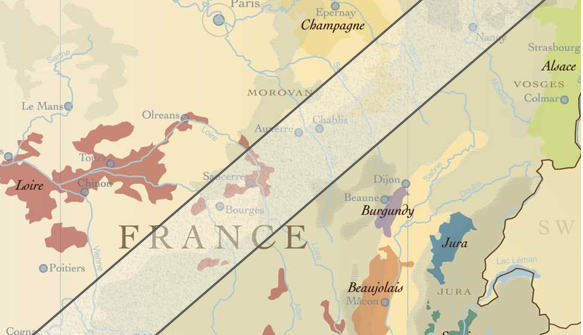 Given that the French invented the concept of terroir – that the place is so important to the wines it produces – and that the French have the most delineated wine/land appellation system in the world, why were these areas not grouped together by themselves to form a new region? Parent region has had little effect on the reputations of world famous places such as Sancerre, Pouilly (as in Fumé) and Chablis. This fame though, is largely down to the unique expressions of the crisp white wines produced, and this stems from the unique soil. Chablis sits 75 vine-free miles north of the Cóte de Nuits in Burgundy, and the towns of Sancerre/Pouilly are about the same distance away from the next vines in the Loire. With the Loire valley being over 170 miles in length you will naturally find numerous grape varieties, soil types, and even climatic influences, but Sancerre/Pouilly find themselves planted over to Sauvignon Blanc/Pinot Noir as opposed to the main Loire white/red varieties of Chenin Blanc/Cabernet Franc. As the soils along the banks of the river have a greater composition of rock/schist compared to the chain, different varieties thrive. Co-incidentally, Decanter recently ran a feature on the red wines of Sancerre, suggesting they were more Burgundian in style, and unlike any red you would associate with the Loire. In Chablis, they may use the Burgundian variety of Chardonnay, but they produce a very different style of wine. Chablis is widely respected for its crisp mineral whites full of refreshing acidity, and linear precision. This is streets away from the archetypal Burgundian Chardonnay; a deep brooding body with creamy/buttery textures from subtle oak barrel influence. Again this comes from differing production methods (favouring Stainless steel as opposed to barrel), and the unique terroir – the Chardonnay grape working magnificently on the cold limestone and clay. It’s a different story when we look at the Aube in southern Champagne, as they haven’t yet managed to find real fame on their own merit. Just over 100 years ago, The Champenois – notorious for protecting their brand – drew up their permitted production zones, and excluded the Aube on the basis that their grapes were of a second standard (they had no Premier or Grand Cru sites). The Government even went as far as passing a bill to that effect but, unsurprisingly, this didn’t go down well with Aube vignerons, and the rioting that followed in 1911 saw a worried government hastily annul the original bill. The Aube were finally officially admitted in to the region in 1927, but their role has simply been to provide the grapes to round out Champagne blends. If the Aube vignerons hadn’t persisted in the uphill battle to be part of a region that was so dismissive of it, could they have pushed harder with their wines, achieving better than just producing grapes suitable to only form part of a blend? Being mainly planted to Pinot Noir and Chardonnay, both key components of Champagne, but having the clay based soil of the Kimmeridgian chain instead of the deep chalk found elsewhere in Champagne, they’re capable of producing a Pinot more Burgundian in style. A feature late last year by US publication Wine Spectator suggests that wines from the Aube are on the up, but time will tell. Should these villages have historically clubbed together and formed a mini-region of their own to produce world class Sauvignon Blanc, and Pinot and Chardonnay to rival their Burgundian neighbour? Perhaps, due to the fact that quality will always shine through, maybe it hasn’t mattered in which region they sit. It’s interesting to ponder.